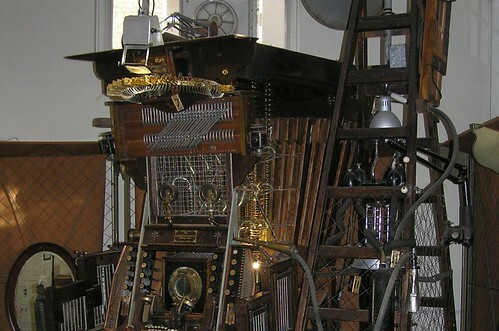 The Story Museum, which opened in 2014, occupies an unrefurbished building in the heart of Oxford and ‘26 Characters’ is its inaugural exhibition, writes Clare Walters. For the exhibition, 26 leading British writers and storytellers transformed themselves into characters from literature and folktales. The courtyard of The Story Museum, Oxford. Top: Holly Smale dresses up as the White Witch from The Lion, The Witch and the Wardrobe. Photo: Cambridge Jones. The Children’s Laureate Malorie Blackman, for example, is the Wicked Witch of the West from The Wonderful Wizard of Oz; Terry Pratchett is the ‘outlaw’ William from Just William; Michael Rosen is Till Eulenspiegel of German folklore; and Holly Smale, author of Geek Girl and Model Misfit, is the terrifying White Witch from C. S. Lewis’s Narnia series. 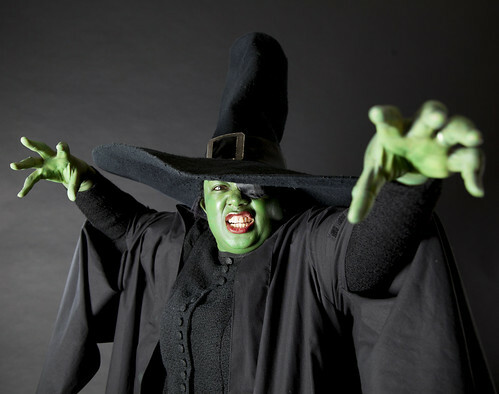 Malorie Blackman as the Wicked Witch of the West from The Wonderful Wizard of Oz. Photo: Cambridge Jones. 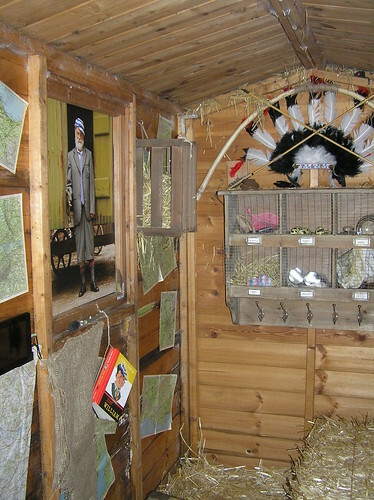 Large photo prints of the authors in character, taken by Cambridge Jones, are displayed within life-size interactive scenes created by a number of imaginative installation designers. These designers include cartoonist and comic book artist Neill Cameron; stage artist and maker Liz Cooke; exhibition and retail designer Philip Cooper; and writer and artist Ted Dewan who, together with his daughter Pandora as Arrietty, is Pod from The Borrowers. Because of the size and sprawling nature of the building (a former sorting office) there is plenty of space, and the designers have made the most of it. 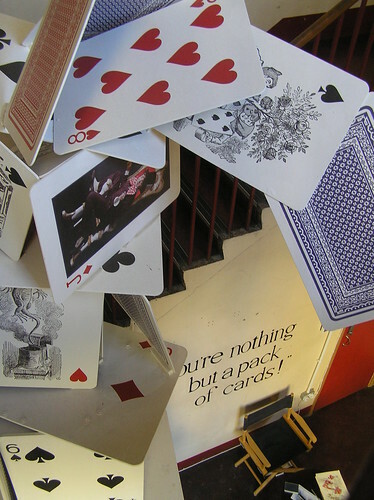 The central stairwell, for instance, features an enormous tower of Alice in Wonderland playing cards. One large room, entered through a wardrobe of real fur coats, is transformed into snowy night-time Narnia. 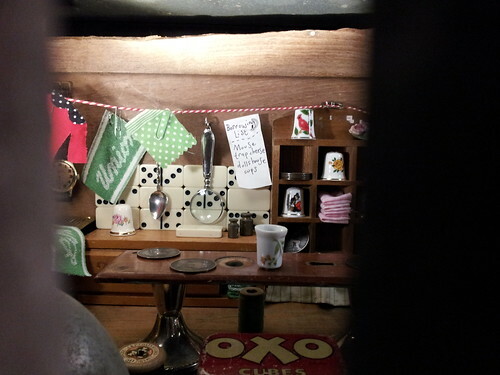 Another smaller room is a cosy kitchen from The Wind in the Willows, while Max’s bedroom from Where the Wild Things Are, chosen by author Katherine Rundell, shares a space with Pod and Arrietty’s under-floor home, glimpsed appropriately through a tiny window at ankle height. Many scenes have atmospheric sounds – such as birdsong, creaking ropes or a boiling kettle – and some have scents, such as Turkish Delight from the intriguing leather box on the White Witch’s sleigh. Each installation also contains a digital tablet so that visitors can listen to an extract from the story. Storyloom at the Story Museum, Oxford, 2014. Several rooms, including those for Anansi, Hanuman and Bellerophon, incorporate cushions, so families and groups can sit and relax. 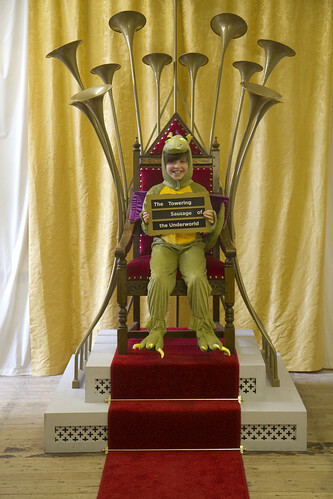 In another space there is a vast steampunk-style ‘Storyloom’ and a rail of dressing-up clothes where children can, like the writers, transform themselves into characters and sit on a ‘talking throne’ to hear their chosen name announced in suitably grand tones. The talking throne. Photo: Duncan Saunders. This multi-sensory exhibition is innovative, immersive and exciting, and on my visit both adults and children seemed charmed by the unusual experience. 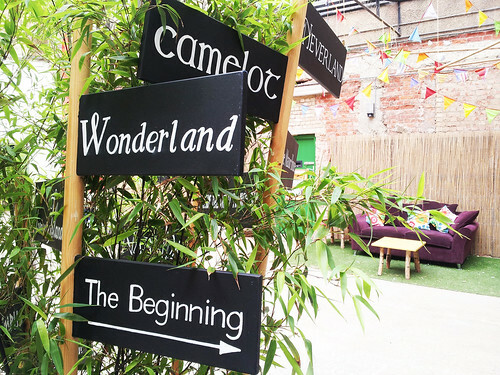 Many people were delighted to recognise stories they already knew, but others, both adults and children, were clearly discovering some tales for the first time. 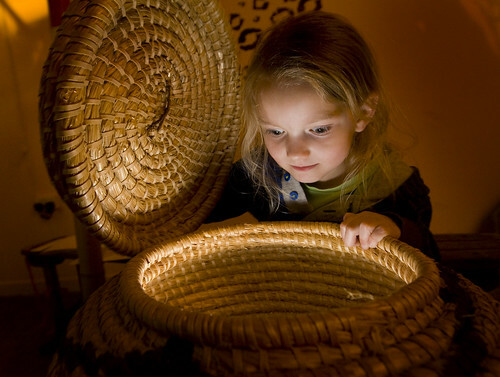 Opening a basket of stories at the Story Museum, Oxford, April 2014. Photo: Antony Moore. The venue is quite rough and gritty, and some scenes are less well realised than others, but overall the quality is high. The exhibition is engaging, fun and memorable, and will introduce a new generation of children to the many rich fictional landscapes from across the world that have entertained and sustained so many of us – some for centuries. 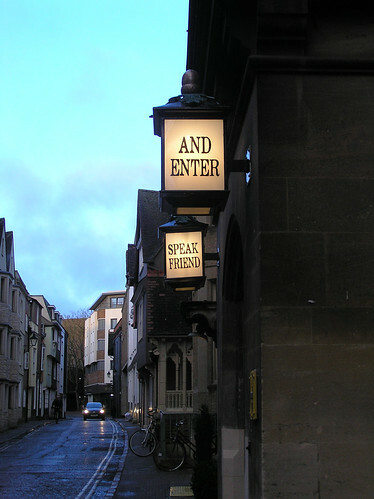 ‘26 Characters’ can be seen at The Story Museum, Rochester House, 42 Pembroke Street, Oxford, OX1 1BP, UK, on Fridays, Saturdays and Sundays until 22 February 2015. 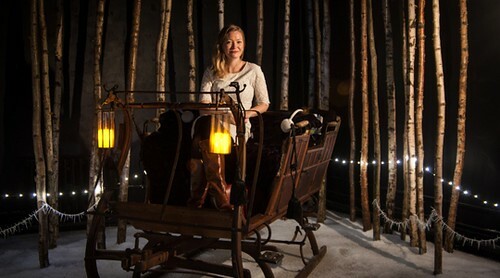 Holly Smale in her Narnia installation, which is entered via a wardrobe of fur coats. 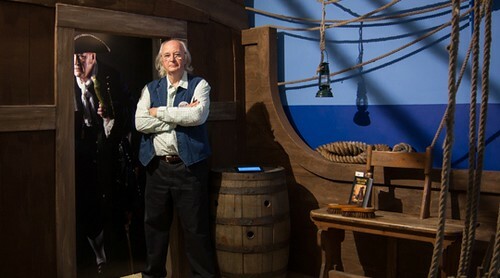 Philip Pullman as Long John Silver. Photo: Cambridge Jones. 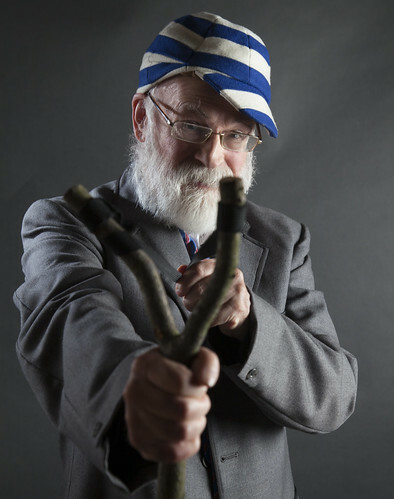 Just William’s shed and (below) Terry Pratchett as William. Photo: Cambridge Jones.